Last week saw one of the most prestigious events in the British yacht regatta calendar return to Cowes for its 15th year. The 2016 Panerai British Classic Week attracted entries from as far afield as Australia and New Zealand. Cowes Yacht Haven (pictured above) played host to a fleet of more than 50 classic and modern classic yachts, including the 29 metre gaff cutter Mariquita, which dates back to 1911. One of the most beautiful classic sailing yachts of all time, Mariquita has a long and storied history. She had several years of racing success under her belt before World War One broke out and she was later moved to Norway. She was extensively restored in 1987 by Fairlie Yachts of Southampton. Last week saw one of the most prestigious events in the British yacht regatta calendar return to Cowes for its 15th year. The 2016 Panerai British Classic Week attracted entries from as far afield as Australia and New Zealand. 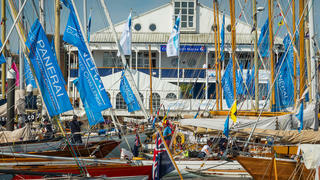 Cowes Yacht Haven (pictured above) played host to a fleet of more than 50 classic and modern classic yachts, including the 29 metre gaff cutter Mariquita, which dates back to 1911. One of the most beautiful classic sailing yachts of all time, Mariquita has a long and storied history. She had several years of racing success under her belt before World War One broke out and she was later moved to Norway. 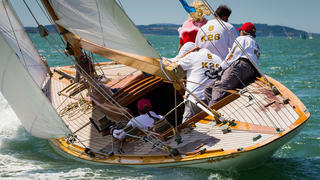 She was extensively restored in 1987 by Fairlie Yachts of Southampton. Of course, the key attraction of Panerai British Classic Week is the close quarters racing, with several elegant yachts vying for first place. Estrella (pictured here crossing Le Rayon Vert) was one of the most successful yachts at the event, winning three out of the six races in the Classic 4 (Classics) category. Of course, the key attraction of Panerai British Classic Week is the close quarters racing, with several elegant yachts vying for first place. 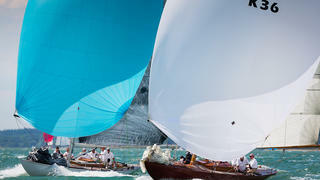 Estrella (pictured here crossing Le Rayon Vert) was one of the most successful yachts at the event, winning three out of the six races in the Classic 4 (Classics) category. Panerai British Classic Week is renowned for attracting some truly historic yachts, and this year's event was no exception. One of the oldest vessels in this year’s fleet was the 22 metre Bristol Channel pilot cutter Mascotte (pictured above). Built by Thomas Cox in 1904, this former working boat was refitted as a yacht after World War One and has been raced, cruised and chartered in northern Europe since 1994. Panerai British Classic Week is renowned for attracting some truly historic yachts, and this year's event was no exception. 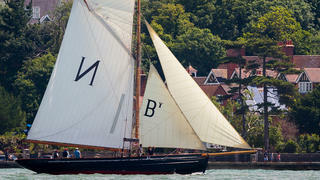 One of the oldest vessels in this year’s fleet was the 22 metre Bristol Channel pilot cutter Mascotte (pictured above). Built by Thomas Cox in 1904, this former working boat was refitted as a yacht after World War One and has been raced, cruised and chartered in northern Europe since 1994. Many of the yachts on the starting line boasted a strong racing pedigree, such as the 14.6 metre William Fife yacht Saskia (pictured above). Built in 1931, she won the Seawanhaka Cup in New York as part of her debut season and has since gone on to compete in the 1936 Olympics and win races in Britain and Australia. Many of the yachts on the starting line boasted a strong racing pedigree, such as the 14.6 metre William Fife yacht Saskia (pictured above). Built in 1931, she won the Seawanhaka Cup in New York as part of her debut season and has since gone on to compete in the 1936 Olympics and win races in Britain and Australia. Breezy conditions off the Isle of Wight helped to create a spectacular event, with stunning spinnakers aloft. Here the 14.9 metre Erica and the 14.2 metre Tore Holm yacht Athena can both be seen with their kites up. 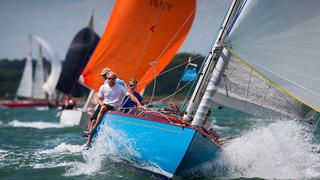 It’s not just historic vessels that are allowed to race at Panerai British Classic Week, however, with the Modern Classics category allowing some of the best modern classic yachts launched in recent years to compete as well. Helen of Durgan (pictured above) is one such yacht, launched in 2003 by Spirit Yachts. Her bright blue hull measures 14.2 metres overall and her bold colouring sets her apart from the rest of the models in the Spirit 46 range. The Suffolk-based yard, which revealed designs for a 33.5 metre Spirit 110 yacht last year, was also represented at the regatta by the 11.3 metre Strega and the 15.9 metre Flight of Ufford. 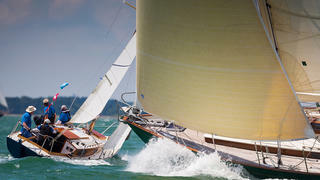 It’s not just historic vessels that are allowed to race at Panerai British Classic Week, however, with the Modern Classics category allowing some of the best modern classic yachts launched in recent years to compete as well. Helen of Durgan (pictured above) is one such yacht, launched in 2003 by Spirit Yachts. Her bright blue hull measures 14.2 metres overall and her bold colouring sets her apart from the rest of the models in the Spirit 46 range. The Suffolk-based yard, which revealed designs for a 33.5 metre Spirit 110 yacht last year, was also represented at the regatta by the 11.3 metre Strega and the 15.9 metre Flight of Ufford.